Craggy outcroppings and crashing surf. White windmills perched high above scenic harbors, as fishermen repair nets, their brightly painted boats waiting patiently in the clear waters. Women working magic as their fingers deftly create delicate lace patterns using a technique handed down over the centuries. This is Portugal’s Silver Coast, and Peniche is one of its finest examples. 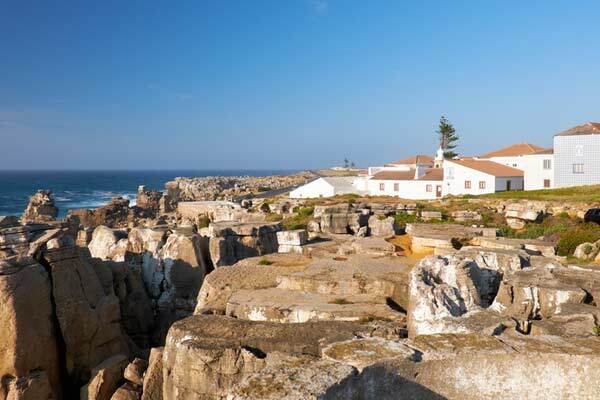 Located on the west coast of Portugal about an hour northwest of Lisbon, Peniche was built on a rocky peninsula. Its geographical prominence made the sleepy fishing village a target of invaders since the 16th century. The solution? Construct a fortress. Standing on its ancient ramparts, smelling the salt air, I imagine those who came before me. These walls kept out some—like marauding pirates—kept in some—like political dissenters of Prime Minister António Salazar in the 1950s and 1960s—and offered a warm welcome to others—like refugees from former Portuguese colonies in Africa. That’s what I found, here—a warm welcome. If it sounds intriguing, read on for my suggestions about where to stay, what to eat and drink, and more in this delightful gem on Portugal’s Atlantic Coast. Note: an extra plus in this area is the ease of finding English speakers. This is an international resort destination, so many of the area’s residents speak enough English to accommodate frequent tourists. I made the colorful Hotel Pinhalmar, a three-star site on the marginal about a mile from the fortress, my home while in Peniche. At a cost of $75 per night, breakfast included, it was perfect. Next time I might bring friends and try Nokori, a three-bedroom, two-bathroom house, one minute from the beach by foot, for $69 a night. 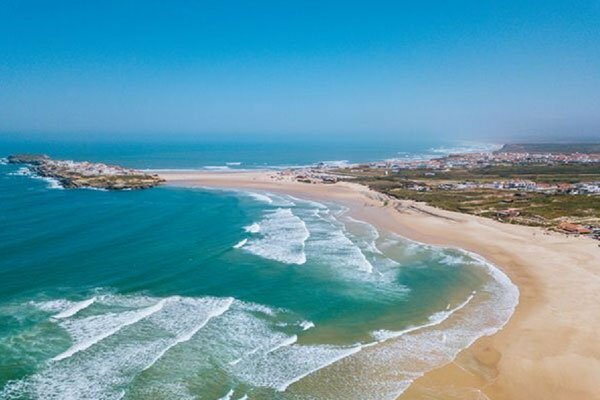 If you’re taken by Peniche when you visit, and decide to make it your home, you’ll find a variety of rental and property purchases available on or close to the ocean or in the neighboring hills. For example, a one two-bedroom, one-bathroom totally renovated apartment was available near the beach for under $500 per month. As you might expect, fresh seafood restaurants abound, serving up tasty sea bass, eel, and crab dishes, among others. If you’re not a fish lover, consider some of the regional countryside specialties: favada à Portuguesa, a simmered dish of various cuts of pork and butter beans. Or game items, like rabbit, or even the simplest of possibilities, roast chicken. We opted for an unusual choice, given our location on the sea. Os Americano’s serves up not what you would expect from the name, but international cuisine, including Russian dishes. If you go, order the cheesy stuffed peppers appetizer with Bolognese-style sauce ($5.70 for a half order of four). The chicken cordon bleu was enough for two to share, and together with bread, polenta, and two adult beverages, our check came to $34. We didn’t have room, but the New York style cheesecake looked like a dream. For starters, walk through the past in the main building of the fortress, now a museum. If you’re interested in maritime matters, you can learn about boat building. You can also discover the city’s long history of lacemaking here. By the 1800s Peniche boasted almost 1,000 skilled artisans creating their exquisitely fine masterpieces. The numbers are smaller today, but you can still watch women, and some men, working in town, especially in summer, when an international bobbin lace exhibition takes place. 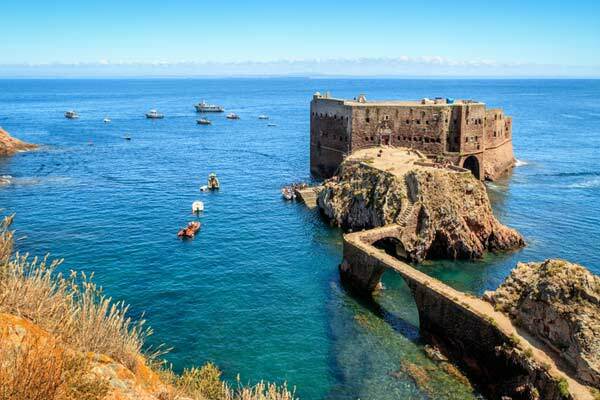 Consider taking a boat from Peniche to the Berlengas Islands, about six miles offshore, or if you’re visiting in summer, opt for the ferry. Given the ocean gusts in this region, the ride can be extremely bumpy, but if you’re into dramatic cliffs, caves, and flora and fauna in one of the world’s original nature reserves, it may be for you. Sunseekers head for Peniche’s long and sandy beaches. One distinctive feature, again, is that these areas are consistently windy, making them attractive to surfing, windsurfing, and bodyboarding enthusiasts. Of special note is Superturbos, the best beach break in Portugal. With its fast-forming waves and powerful tubes, the area has been called the “European Pipeline,” a reference to the Banzai Pipeline in Oahu, Hawaii. Just a half hour by car from Peniche, Óbidos is a town literally fit for a queen: it was given as a wedding present in 1282 by King Dinis to his bride Isabel. Walking the main street through the ancient gates uphill to the castle at the other end of town, one will find artisan shops of local handicrafts, restaurants, outdoor cafés, even a natural food market/bookstore. Be sure to sample the local liqueur made from dark cherries, Ginja. A regional favorite, it’s served in edible chocolate shot glasses for $1.25. Visit in April for the annual Chocolate Festival, in summer for the Medieval Market, or at Christmas for Vila Natal, but do visit. If you want to spend the night, a lovely option is stay in the aforementioned pousada in the town’s castle. The climate in Peniche runs cool compared to the inland Alentejo region and the warmer, southern region of the Algarve. January and February are the coldest months, with highs of 57 F and overnight lows of 50 F. Summertime temperatures range from about 70 F down to 63 F. With 25 inches of rainfall annually, it compares well to the much wetter Porto to the north, with its 50 inches. One ideal time to visit is on the third Sunday of July. Lacemakers from all around Europe—even India, where the Portuguese introduced lacemaking in Goa—gather to preserve and celebrate their craft. If you’re a surfing enthusiast, you may want to wait until the fall to visit. That’s when an annual surfing competition on Superturbos beach, the MEO Rip Curl Pro Portugal brings fans flocking every October. Fly from New York’s JFK to the capital, Lisbon, rent a car and you’ll arrive in Peniche in an hour or so. With the freedom of your own vehicle, you can also see popular sites like Fátima, Batalha, and the medieval town of Tomar, home to the Convent of Christ of Knights Templar fame. The budget-conscious will be happy to hear that Portugal has the second lowest cost of living in Europe after Bulgaria. I was in Peniche for less than a week, but if you planned on a monthly rental of $500 as noted above, you could easily buy groceries, dine out, use local transportation, etc., for less than $1,400 a month. Roundtrip flights from JFK to Lisbon during low season on TAP Air Portugal run about $450 for an economy seat. If you choose to visit at prime summer or fall times, expect to pay double that or more, especially if you don’t plan ahead. Once in Lisbon, rent a vehicle from Europcar for the drive to Peniche, or check out the train situation at https://www.cp.pt/passageiros/en. Bear in mind, however, that Peniche proper does not have its own station, so you’ll still have to take a taxi or Uber or bus into town.